On a recent episode of HBO’s new show Silicon Valley, the hapless coders find themselves in a bind when they realize that the “placeholder” company name “Pied Piper, Inc.” was already in use by Pied Piper Irrigation, another California company. The problem is that they received a check from a venture capitalist in the name of the Pied Piper Inc. – humorous situations then ensue as the protagonist tries solve the problem – and then, I began ranting at the television to the chagrin of my wife. Why, you might ask, does this drive me crazy? Not because it is a common and overused plot point, but more notable because it gets both state registration laws and trademark laws completely wrong by muddling the laws of business registrations and trademarks. Someone already registered my business’ trade name – what do I? A trade name is the name used to identify the business. States have varying restrictions on registration of similar names when forming a new business – primarily, they need to see that the name (along with the designated business form – inc, corporation, limited liability, etc) is not already in use. This means that while an exact match of something like “Pied Piper, Inc.” will not be allowed, other variations might be. So in some states “Pied Piper, Corp”, “Pied Piper Holdings, Inc”, or even “Pied Piper 2, Inc. will likely be acceptable for registration of a different business. Some states even allow it to go as far as “Pied Piper Inc.” vs “Pied Piper Incorporated”. As an example, there is currently an active company registered in California with the name Pied Piper, Inc.” – there is also “The Pied Piper Exterminators, Inc.”, “Pied Piper Players, Inc.”, and “Pied Piper Play Center” – there are also suspended businesses using similar variation on the theme. Simply put, the standard of what variation of name is acceptable is not that high and the problem for the boys in Silicon Valley aren’t real in regard to the business trade name. In the TV show the issue came up because the protagonists had received a check made out in the name they had been using as a placeholder; the reality is that most banks aren’t concerned with minor variations in the corporate name and “Pied Piper IP Holding Company”, will most likely be able to cash a check made out simply to Pied Piper, Inc. But that other company is using my trademark. 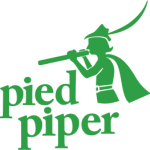 On Silicon Valley, the episode moves forward to discover that the company trademark PIED PIPER is the company name of a nearby irrigation company. My response — so what? Trademarks are not simply the name associated with any business, but rather a name associated with specific goods or services. Is there any likelihood that someone buying software using the mystery algorithm that is the core of the tech companies’ product is going to confuse that it originated from the irrigation company services? – not likely. Both companies can simultaneously use the mark PIED PIPER without any concern of trademark infringement, because there is little likelihood of confusion by consumers. But my trademark has to be the same as my trade name. Nope – not true – while the two are often related, there is no rule that says they have to be the same. The best example for this is Doctor’s Association, Inc. Who is Doctor’s Association? – well you probably know them better by their SUBWAY trademark. What this means is that our newly minted entrepreneurs can register whatever business name they want, and still operate under the trademark PIED PIPER, and there is no need for them to go and purchase the name from the cranky irrigation company owner. So what is the take away here? – don’t take legal advice from TV sitcoms – then again I hope you already knew that. By the way, it is a funny show.